Many Iraqi Artists Struggle, Suffer In Silence Three decades of hardship sent most of Iraq's artists into exile. Some have remained, but very few of these make work that reflects the violence and difficulties surrounding them. For more than a century, Iraq was a beacon of visual art in the Arab world. The Ottomans, the British and the Iraqi rulers who followed prided themselves on the fact that Iraqi artists studied their craft abroad, then returned to practice it back home. Artists even thrived under Saddam Hussein. Then came the Iran-Iraq War, crippling U.N. sanctions, the first Gulf War, the U.S. invasion and the brutal sectarian fighting. Three decades of hardship sent most of Iraq's artists into exile. Some have remained, but very few of these artists make work that reflects the violence and suffering that surrounds them. 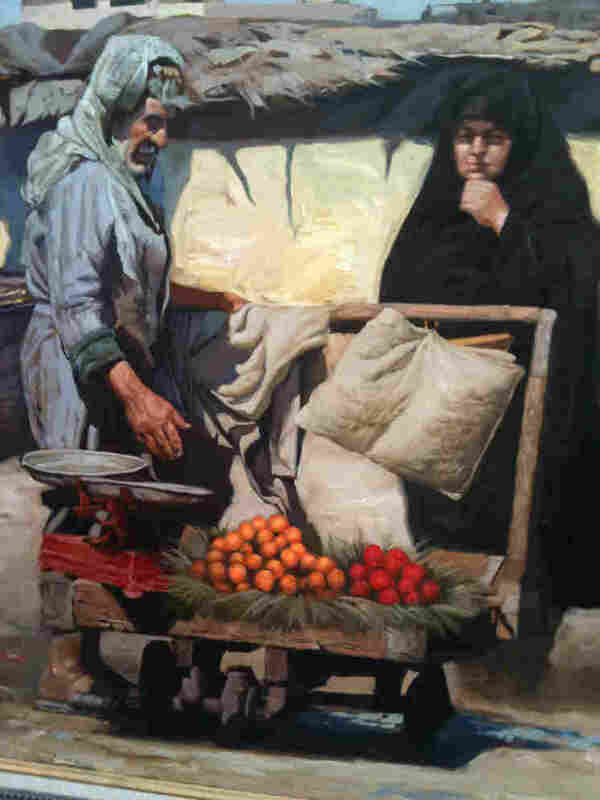 The most popular paintings at Abu Afnan's gallery are nostalgic, orientalist depictions of a simpler way of life in Iraq. Under Saddam, artists knew that as long as they stayed on message — building monuments to the regime or making paintings that showed the dictator as a benevolent folk hero — they wouldn't be punished. Other artists learned that abstraction was not only a way to emulate their counterparts in the West, but it was also a way to conceal their ideas from the dictator. There's no dictator now. 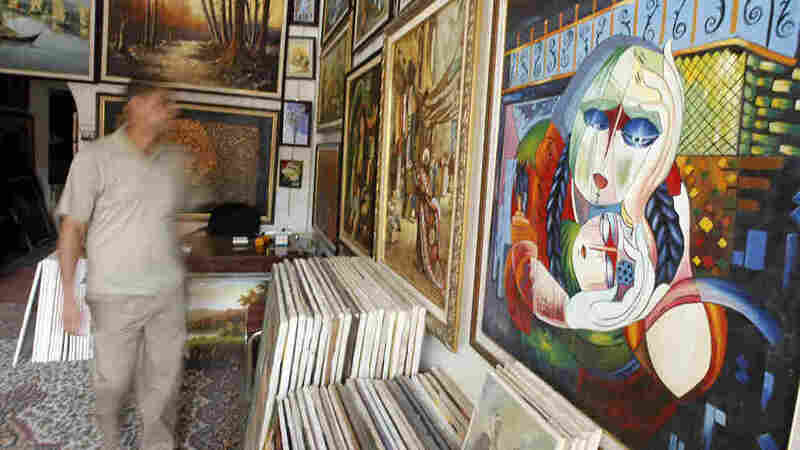 Yet the number of galleries that sell Iraqi art in Baghdad is just a fraction of what it was before. Abu Afnan is one of the few who has kept a gallery open through it all — in a relatively safe, middle-class neighborhood of Baghdad. Some of the gallery's best paintings are by the so-called sanctions generation, who came into their own during the 1990s. One painter has some turbulence in his work. The rest are pretty tame: abstract water buffalo, collages of a bygone Baghdad, and cubist versions of veiled women. In other words, there's no war here. Abu Afnan says that's the way the artists want it. "Violence is one of the daily things we see everyday," he says. "And we want to forget about it." Other artists say it's much more sinister than that. Across town, at the well-known Hewar Gallery, the owner throws big river fish on the fire for lunch. Artists sit around arguing and drinking while they wait for their food. Mahir Mohammad, a ceramicist and art professor, says if Iraqi artists depicted the violence around them, that would be seen as critical of the government. "They want us to say the government is good, and the Americans [are] good, the policy now is good," he says. The government has been cracking down in recent weeks, closing social clubs like the Hewar Gallery that sell alcohol and threatening to tear down public sculptures that show the human form. Mohammad says artists fear being harassed or even kidnapped. But he says it's hard for them to just ignore the fact that life here is still a struggle. "Sometimes, in your studio, you remember you lost a friend, you lost your electricity, you lost the dignity," he says. "So we have to put this in our pieces." Nearly everyone here agrees that if Iraqi artists want to make work about violence and destruction, they're more free to do it outside Iraq. That was clear at a recent opening at the well-guarded French cultural center. 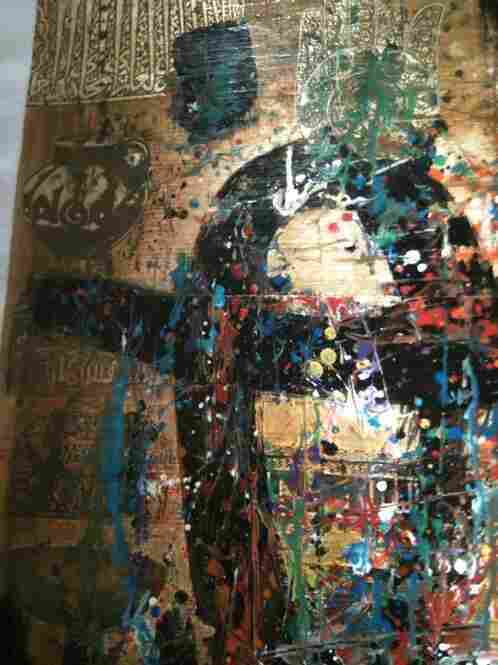 The work was by Karim Saifou, an Iraqi artist who's based in Paris. 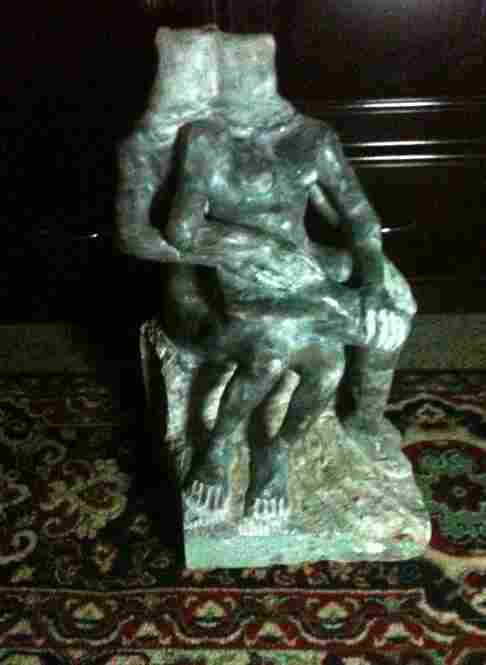 Artist Abdel-Karim Khalil is an Iraqi sculptor based in Iraq. He says his latest pieces are inspired by images of the war. He poses his sculptures in the classical style but he adds jarring details, like the bag over the figures's head here, to symbolize torture. Khalil says his latest pieces pieces are bodies, or parts of bodies, set in classical poses but with signs of torture or dismemberment. 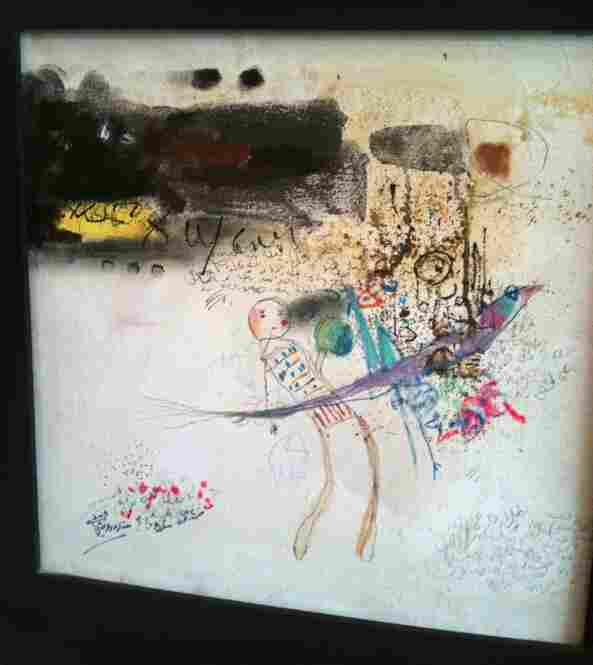 Some of Khalil's paintings, like this one, reflect a surrealistic world before the U.S. invasion of Iraq, when artists could thrive under dictator Saddam Hussein as long as their messages were hidden. A marble piece, in progress, in Khalil's studio. 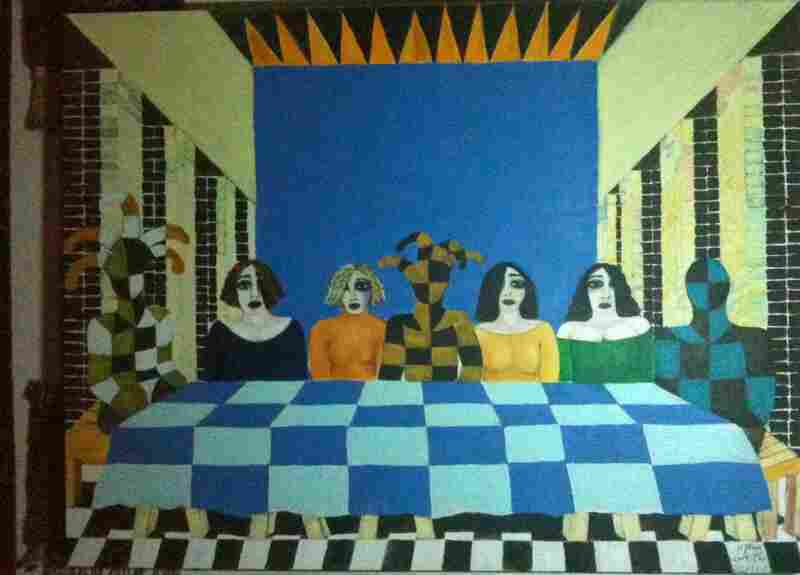 Artists from the "sanctions generation" depict Iraqi women with a modernist sensibility. 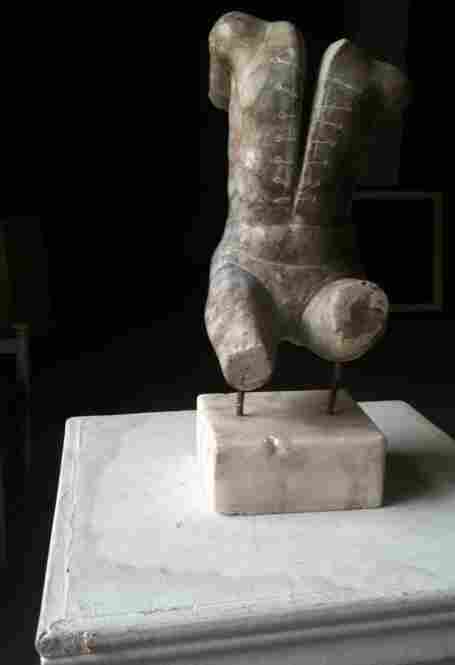 Khalil often uses martial themes, like the army boots on this figure in repose, and the otherworldly helmet-like figure at left. 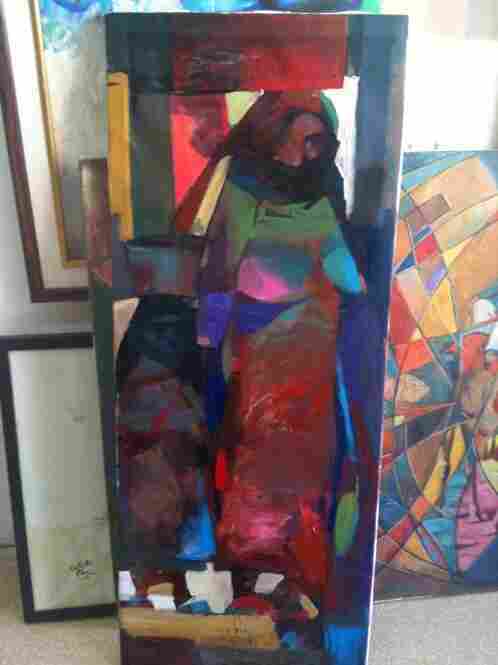 Sattar Darwish is one painter in the so-called sanctions generation whose works are on display at Abu Afnan's gallery. Based in Iraq and Jordan, Darwish is the only artist featured at the gallery whose work reflects the turbulence of everyday life in Iraq. Karim Saifou is an Iraqi artist based in Paris. This detail shows the layers in his work. Saifou says the shapes in the golden layer represent the art of Iraq's ancient past. The top, chaotic layer represents the destruction of that heritage by recent conflict. Saifou's pieces are like two paintings on top of each other. The bottom layer is made of shapes from Iraq's Sumerian and Babylonian past. The top layer is black and angry. Saifou says he wants to show how Iraq's ancient heritage was ruined after the U.S. invasion, when Iraq's art museums were looted, and no one did anything to stop it. This kind of work plays well in Europe and the U.S. In fact, the more violent Iraqi art is, the more Westerners seem to like it. Later, after the opening, a few artists gathered for a panel discussion. 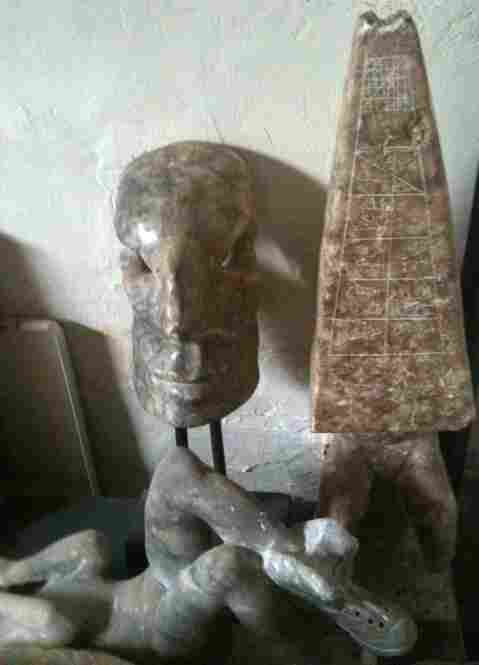 One Iraqi sculptor came in late. His jacket was rumpled, his speech uncouth. His name is Abdel-Karim Khalil. His best-known work is a piece in the shape of the iconic torture photograph taken at the Abu Ghraib prison. 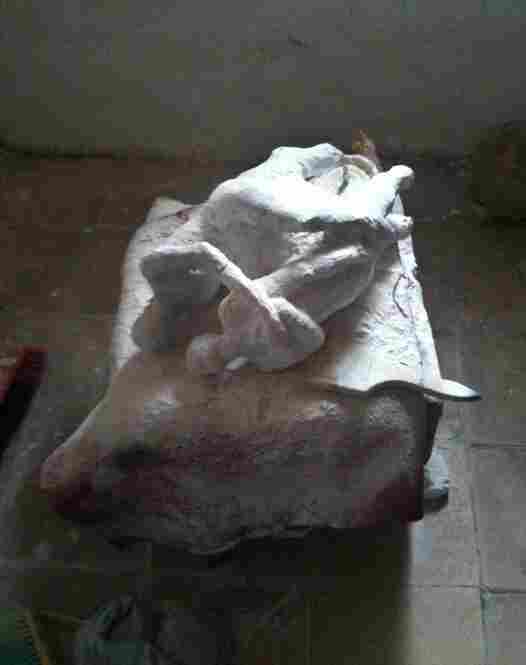 Khalil carved the man with outstretched arms in marble and put a paper bag on his head. Khalil's work was featured in a show in Texas. But he was denied a visa to the United States. Khalil later brought NPR reporters to his home studio. His pieces are marble figures in classical Greek poses, but then you realize they're cadavers with staples in them or wearing bizarre military helmets — beautiful and horrifying at the same time. Khalil says his pieces come from violent images he remembers from the war, images he can't get out of his head. "They are pressurizing me, they are paining me a lot. So just to get rid of the pain of them, their impact on me ... I make them on marble," he says. That's why we need to make art, Khalil says. Even if it gets you in trouble, or doesn't sell, it helps relieve the burden.